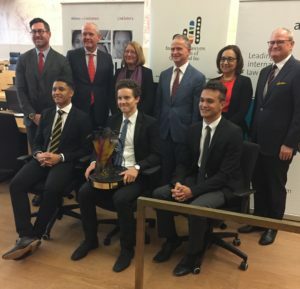 The Indigenous Lawyers Association of Queensland (ILAQ), in partnership with Allens, Ashurst and North Quarter Lane Chambers, is delighted to announce Nicholas Costello of Griffith University as the winner of the 3rd Aboriginal and Torres Strait Islander Student’s Moot Competition. The competition was launched with a welcoming event held by Ashurst, which followed the students attending a submissions writing and advocacy workshop delivered by barristers of North Quarter Lane Barristers Chambers. On 28 July 2017, students from Bond University and Griffith University participated in two rounds of mooting before Justices Boddice SC and Philippides SC and prominent Queensland silk. ILAQ would also like to thank runners-up, Daniel Hamilton and Jordan Kilcoyne of Bond University for their outstanding performance and wish them all the best with their studies in the future. This years’ question was drafted by Chris George, barrister of North Quarter Lane Chambers and Linda Ryle, President of ILAQ. 2016 Zachary Frazer and Mollie O’Connor from University of Queensland. 2015 Candice Hughes and Michelle Rabbidge from Queensland University of Technology. ILAQ is committed to supporting Aboriginal and Torres Strait Islander students in providing opportunities for personal and professional development as well as providing some financial assistance where possible. ILAQ would like to thank our partners Allens, Ashurst and North Quarter Lane Chambers for their ongoing commitment, support and contribution. Special thanks goes to Justices Boddice SC and Philippides SC for volunteering their time and for their ongoing support for the competition and Aboriginal and Torres Strait Islander students. Further thanks goes to Chief Justice Holmes SC for allowing the competition to be held in the Banco Court. ILAQ would also like to thank Wayne McGuinness of Aboriginal Steel Art for designing and crafting the competition trophy and lapel pins – www.aboriginalsteelart.com. Media contact: For more information contact mediaevents.ilaq@gmail.com.